It's been a few hours since I've finished this novel and yet my mind is still positively reeling with images of the world cleverly crafted by Bachmann. Readers of my blog ought to know by know just how much I value good world-building, and I was thrilled to find out that Bachmann took immense care in creating the world of The Peculiar. Every detail was rich; every minute detail was explored thoroughly so as to give readers the best reading experience possible. From the first page alone, I was thrusted deep into this magical world - I could practically see myself ambling along the dark alleys of Bath, truth be told! I enjoyed reading about the character of Bartholomew. Bartholomew is a Peculiar, a changeling - half-human and half-fay - and he's been hiding all his life. His entire life he has been nothing but wary of those around him, and yet it was clear from the get go just how much he craved friendship and belongingness. I also loved how protective he was of his sister, Hettie, and how he was willing to do anything for her well-being. While reading The Peculiar, I was nothing but heartbroken at all the painful experiences both Bartholomew and Hettie had to go through at such young ages. Throughout the course of the novel, I couldn't help but notice how parallel Bachmann's world is to the one we currently live in. Just like Bartholomew and Hettie - born half-human and half-fay - people considered 'different' are ostracized and sneered upon. Quite similar to the corrupt politicians rampant in our world today, Bath also had its fair share of so-called leaders who were only looking out for themselves. Poverty was also mentioned a few times in The Peculiar. Lastly, the character of Arthur Jelliby, is someone who I'm sure everyone has encountered in their lives - he started out as quite an apathetic man, preferring not to be in the thick of things, but all that changes when he discovers something evil going on and does all that he can to stop it. 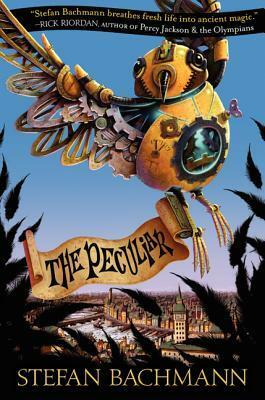 While The Peculiar may be classified as a novel adhering to the middle-grade genre, I have no qualms in saying that it can be enjoyed by adults as well. As a matter of fact, the plot is a little bit dark with mentions of both kidnapping and murder, so this is definitely not your average, fun-filled read. With that being said, I can't wait for the sequel, and do yourselves and grab a copy! Trust me, you don't want to miss out on the sheer brilliance of Stefan Bachmann! This books sounds SO cute! I really want to read it now. I am so glad you liked it. I too enjoy good world building and that aspect of the novel really intrigues me.